And what if they move with a defense order with a special maneuver? Do they also count as stationary and don't suffer the -1 penalty? Does a defense order always mean that the unit count as not having moved? Yes, they don't Move, they just make minor shift. Also (from simulation perspective) they've acted in proper order, with ignited fuses and muskets at ready. I would interpret Orders as intentions of what units should do, what men are expecting and what are prepared for. With Defence Order units are fully prepared, with closed ranks, weapons at ready etc., whereas with Movement Order they are expecting marching. Please remember that unit of 6 bases is representing body of 300 men and they are not fully aware of battlefield situation. If colonel said to prepare for advancing and then suddenly you have to start firing (in game terms - unit of musketeers with Move Order which want to shoot in Shooting after Movement phase) you will be less efficient than prepared rank and file formation. I have a question regarding a special vase for a counter charge where I've got a difficulty in interpreting the rules. The situation. Unit A is 3 bases wide, 2 bases deep (total 6 bases). Unit A's line of sight (180 degrees front arc) just clips the right hand base of Unit B. Unit B declares a charge on unit A, Unit A shows a acharge order and declares a counter charge. For unit A to reach Unit B it needs to wheel, end move forward. Total range neccessary about 30 cm. Unit B can contact Unit A after 8 centimeters. What is in this case the half way point? I guess it is not 4 centimeters (half of distance B to A). How do both units move, and how do the end in contact? With other systems Unit A starts to wheel, but after 8 centimeters it is caught in the flank by Unit B, what happens here? The Boyar Sons had Initiative and declared a charge. The Reiters had the Boyar Sons in their 180 degree vision arc and declared a countercharge. The distance between the units was 8 cms. The usual procedure would suggest that you measure the distance between the charging units and have them meet half way. Since the Reiters will have to wheel 90 degrees, the full charge range of the outer base on the left to the Boyar Sons base on the right is about 20cm's. Meaning that the halfway distance is 10cm. Which would mean that the Reiter base on the right would actually have to move backwards 2cm. It would also be highly unfair to the Boyar Sons to have them lose their obvious flank maneuver bonus. In this theory, the Boyar Sons also wheel in, meaning they would still catch the Reiters in the flank. As Iluzagin said: "Unit A (Reiters) starts to wheel, but after 8 centimeters it is caught in the flank by Unit B (Boyar Sons)". What happens here? There may even be several other theories. I'd just play it step by step and see what the geometry of the situation dictates, keeping in mind that the counter charging unit moves first. 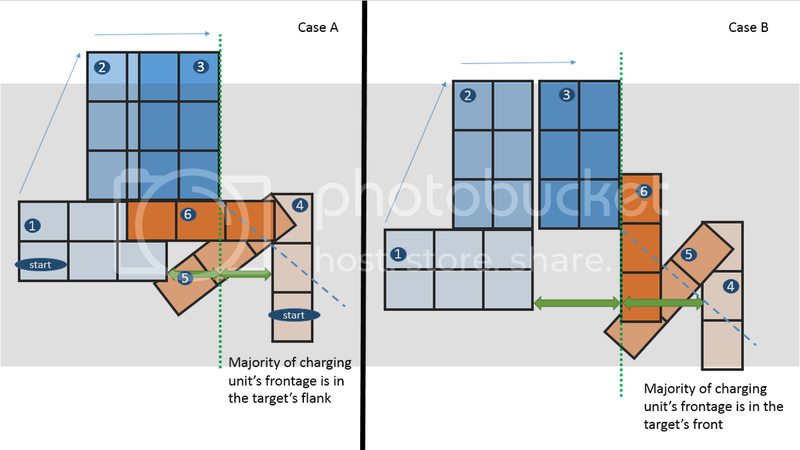 The difference is where the target unit is after making its counter charge move in relation to the charging unit. Depending on the starting positions, it either has the charging unit on its flank or to its front. Thanks, that helps a lot already. But one thing remains unclear: do both units meet halfway? If so, from where to where do you measure? Because it looks like the left base of Unit Blue is moving a lot more than the Red Unit. You start with countercharge. That unit moves to front/side depending on what side is visible to most bases and moves to half of distance to its target. Then unit originally charging proceeds with its movement. But one thing remains unclear: do both units meet halfway? If so, from where to where do you measure? Because it looks like the left base of Unit Blue is moving a lot more than the Red Unit. You measure simple, shortest distance between the units, so yes, it's possible that one unit moves a lot further than the other one. Keep in mind, however, that you do this at both stages of the charge: basic move and additional move. If the units don't make contact during the basic move because one unit was too far from the midway point. (ex. it had a long wheel), during the additional move, that midway point gets adjusted and the movement continues. While being fairly simple, the countercharge rule works really well in most cases with seemingly strange interactions only happening occasionally. As far as the concern that in your situation the flanking unit is loosing its advantage, a better way to think about it is that it never had that flank charge advantage. It's fairly difficult to flank charge an enemy who can see you and is ready with a counter charge. That actually plays very well.